香港/Hong Kong — the Asian tech hub? What comes to your mind when you first think of Hong Kong? Dim sum? Dragon boats? Flashy Lights? Busy financial centre? What about entrepreneurship? Although few people would have associated Hong Kong with the tech industry a few years ago, the recent boost in the local startup scene and innovation parks has drastically changed the game, making Hong Kong an important player with formidable potential for the upcoming years. But before I introduce you to one of the world’s most vibrant and multifaceted cities and its rapidly growing tech scene, let me first tell you a bit about myself. First off, I am neither an engineer nor an entrepreneur — I am a theoretical physicist. But don’t run away! My boss at swissnex won’t allow me to write equations, so you are safe. I first discovered Hong Kong a few years ago during an exchange year abroad from the Swiss Institute of Technology, Lausanne (EPFL). It didn’t take long for me to fall for the city, and once my exchange was done, I couldn’t wait for the next chance to return. That opportunity came this Spring, between the end of my Masters in Columbia University and the start of my PhD at Stanford. After reconnecting with the research groups at the Hong Kong University of Science and Technology (HKUST), I learned that a new Particle Theory Group had been formed, led by Henry Tye, a renowned cosmologist from Cornell University. I now have the privilege of working in this group, collaborating with the local postdocs and PhDs, and enjoying the view on Clear Water Bay for coffee breaks. Now how is all this connected to entrepreneurship? During my stay, I wanted to discover more of what Hong Kong had to offer, and decided to work part-time for swissnex as their official scout in the area. So when I am not busy developing mathematical tools to describe neutron stars and black holes, I visit incubators and co-working spaces, interview young and ambitious or experienced and insightful entrepreneurs, and take part in pitching nights or other startup events. In a nutshell, my job is to determine whether (and how) Switzerland should strengthen ties with Hong Kong in the Research and Development sectors, both academic and entrepreneurial. In particular, should budding Swiss startups start looking towards Hong Kong as a potential launching platform? I believe the answer is YES. Hong Kong has long been a strategic location to set up small businesses. Visas are easy to come by, taxes are low for SMEs, and the city offers access to the enormous Chinese market, without the legal fuss of starting a business directly in the mainland. There is virtually no language barrier, and making connections is so easy it is practically inevitable. However, Hong Kong has traditionally not had a very entrepreneurial spirit. The widespread money-driven mindset has lead most fresh graduates to choose finance over science, or large and well-known companies over young startups. That being said, public opinion is changing and Hong Kong now has the necessary infrastructure to become Asia’s tech hub. Less than 4 years after the launch of HK’s first co-working space, the city now has over 20 freelancer-friendly locations (5 of which opened in the last 2 months), making the high rent problem virtually obsolete. It has become difficult to decide which of the numerous startup-related events to attend, these ranging from startup weekends and pitching nights at CoCoon, to startup grind events hosted by the Hive and other co-working spaces. The change in public opinion can also be felt in universities, where entrepreneurship is now considered a viable career path (see e.g. 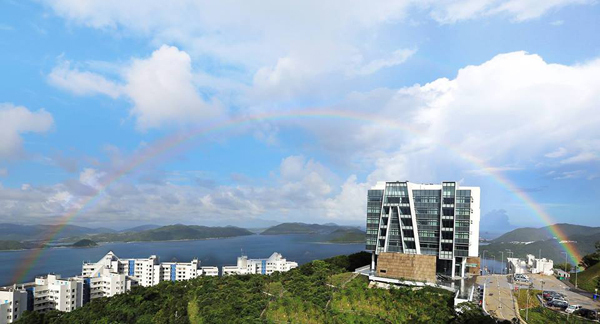 HKUST Entrepreneurship Center). On the R&D side, the Hong Kong Science and Technology Parks Corporation (HKSTPC), Cyberport and the Hong Kong Design Centre have defined sectors where Hong Kong could potentially become the center of excellence in Asia over the next few years. For instance, the HKSTPC has formed 5 technology clusters (which match very well Switzerland’s areas of expertise!) and is looking for additional research groups to join. The Hong Kong government has also shown keen interest in intensifying development in innovation by increasing support from the Innovation and Technology Fund (ITF), and proposing to “set up an Innovation and Technology Bureau as a centralized body to co-ordinate and promote innovation and technology policy” (source: gov.hk). An entrepreneur who had recently expanded his business to Hong Kong once told me: “In my state in the US, I had 300 competitors for a market of 1M people. Here in Hong Kong, I have China as a market, and 10 competitors”. Whether you are a young engineer with a new product or an experienced entrepreneur wishing to expand your SME, now is the time to pack up your ideas and head over to Hong Kong to catch the wave before it leaves!